Let's be honest, most kids need a little extra practice to grasp concepts. 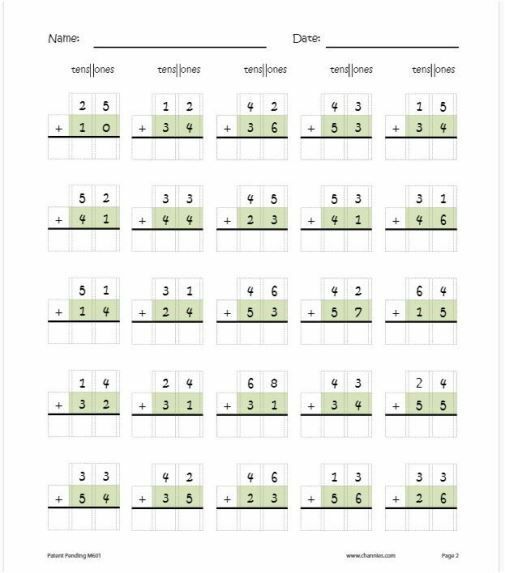 We recently had the opportunity to review the One Page a Day: Double Digit Math Problem Workbook from Channie's Visual Handwriting & Math Workbooks. This was the little bit of extra practice that helped Caty get back on her level. Some days it's really hard to homeschool. Life happens. Distractions happen. Sometimes it's special needs that need that extra practice. Well we had all of that happen to us over the summer. Caty was a bit behind in her double digit math. She saw the concept, but definitely needed some extra practice with this skill. This consumable workbook provides students with roughly 25 problems each day for them to practice double digit addition and subtraction. It starts out with no carryover/borrowing, and then as your student works their way through the book and masters basic double digit math, it advances to addition carryover and subtraction borrowing. How did we use this product? Right along side her math curriculum that Caty has been using. We plan on spending through December reviewing basic concepts that Caty was struggling with in early elementary Math, so we are using Life of Fred and Living Math in combination. 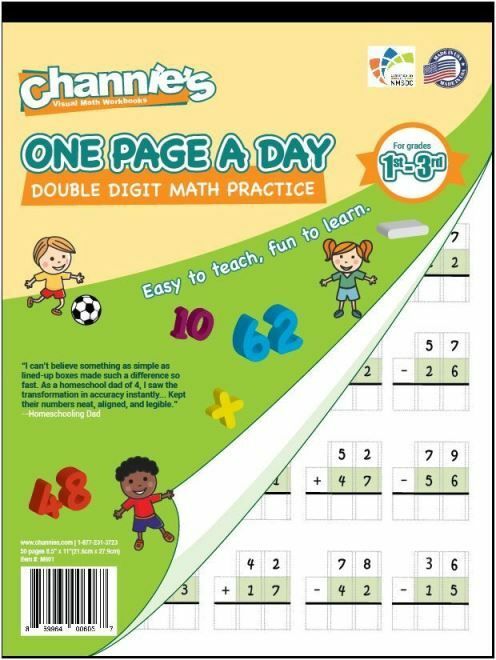 The Channie's Visual Handwriting & Math Workbooks - One Page a Day: Double Digit Math Problem Workbook has slipped right into this combination as if it was specifically created to go in our program of study. As I am reading her lesson to her from Life of Fred, she works on her worksheet to practice skills. (Bet you can't tell what her favorite September homeschool outfit has been....lol) Each worksheet takes her roughly 15 minutes to complete. Obviously the first few she zoomed through very quickly due to the simplicity of the problems. But as she had to do more steps, she had to force herself to slow down and work on those steps. The One Page a Day: Double Digit Math Problem Workbook has really helped her to get the practice she needs to conquer what she felt were monumental problems preventing her from moving on to her 4th grade math study. The problems are color coded for your child to easily separate the numbers, as well as "grided" so they can match them up easier. I know this style was easiest for Joey to use as he was adding in extra columns to add and subtract. When you have a student who is dyslexic or has visual processing problems, this math style works out great to help them! You can choose to either tear the sheet out of the workbook or we just left them attached inside, and kept all the practice sheets together. The workbook is not spiral bound, tear apart at the top. But Caty was easily able to flip the pages over and it stayed open. The One Page a Day: Double Digit Math Problem Workbook was created for Grades 1 - 3. I highly recommend that if your student is even in an upper grade and is struggling, use this resource. It's that repetition that will help them to get into their own pattern for solving the problems, and the layout is great for visual delays. Now the One Page a Day: Double Digit Math Problem Workbook is strictly a practice workbook. It is not meant to "teach" your student how to do the math printed. So if you are looking for pages filled in with instructions, this is not that book. But if you want to teach your child the non-common core way of solving problems, you would definitely want to use this workbook. You could easily get them started on the problems and then let them finish the page each day. This 50 page book - which is only $12.95, would save you a lot of time and money on printer ink also!! I wish I would have had this for the boys a few years ago. Would've really helped us out with daily practice. Several members of the Homeschool Review Crew were given the opportunity to review Channie's Visual Handwriting & Math Workbooks - One Page a Day: Double Digit Math Problem Workbook, as well as several other practice books by Channie's Visual Handwriting & Math Workbooks. Be sure to check out the link below to see how they used these in their homes and with their families.